Dr E Neil Lewis, Chief Technology Officer at Malvern Instruments and Head of the company's Bioscience Development Initiative, will speak at the International BioAnalytical Congress taking place in Berlin (Germany) on 11 and 12 September 2013. The theme of the conference is the future of bioanalytical development and Dr Lewis will discuss ‘Advances in the integrated measurements of higher order proteins', focusing especially on new technology that combines dynamic light scattering with Raman spectroscopy. He will examine this as a means of providing structural, thermodynamic and kinetic insights into mechanisms of protein aggregation and the factors that influence protein stability. Malvern is pleased also to be a sponsor and exhibitor at the Congress. The new Viscosizer 200 which automates low volume viscosity measurement and size analysis. It is ideally placed to serve those working within biopharmaceutical preformulation and formulation development who need rapid viscosity information on a large number of low volume samples, in order to assess candidate developability. Archimedes, which uses the technique of resonant mass measurement to detect and count particles in the size range 50 nm - 5 µm. 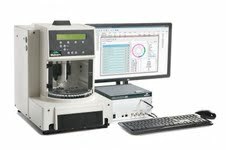 It is especially useful for characterizing protein aggregates in formulation or buffer. The Zetasizer Nano ZSP for the measurement of size, electrophoretic mobility of proteins, zeta potential of nanoparticles and surfaces, and optionally the microrheology of protein and polymer solutions. Protein mobility is one property that has been identified as a promising indicator of formulation stability, viscosity, and behavior. Viscotek SEC-MALS 20 extends Malvern's family of light scattering detectors for measuring the absolute molecular weight of proteins, macromolecules and polymers. Static light scattering is widely used within gel permeation/size exclusion chromatography (GPC/SEC) for the determination of the absolute molecular weight of protein, polymer and macromolecular species without the need for external, potentially inaccurate calibrations. Go to www.malvern.com for details of Malvern's full range of analytical solutions.